Working moms are often viewed as frazzled and less committed to their jobs, but for many women motherhood can make them more ambitious. A funny thing happens if you search “working dad clipart” and “working mom clipart” on Google. The dads look pretty relaxed: One is straightening his tie, another is kicked back in a recliner, and there’s even one image of a guy holding a beer–with no kids in sight. In fact, half of the images for working dads don’t even include kids at all. On the other hand, the moms are frantic: In some images, they have octopus arms doing eight different things at once or are slumped in a chair looking exhausted. You could see their babies (or baby-related items) in 25 of the 27 images that show at the top of the page. So it shouldn’t be a huge surprise that when many people think about the archetype of the working mother of young children, they have in mind a vision of a frazzled employee. Maybe she has spit-up trailing down her back and didn’t notice it, or she accidentally wore two different shoes to the office because she’s so sleep-deprived. Maybe she’s like this mother, always half in the office and half at home, or even this one, frying her laptop with a pot of water while her baby wails on the floor and dinner burns in the oven. I hate all of those tropes, even though there’s some truth to them: Working moms do sometimes feel overwhelmed. But the stark differences in how women and men are portrayed fuels unconscious bias. 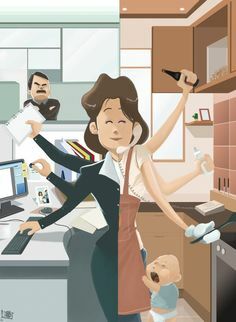 Yes, this is just clipart, but those cartoon drawings are a reflection of what people have internalized about working parents: cool, calm, and collected dads kicking back; frenzied, harried moms torn between work and family. So when it comes time to make a hiring decision or a decision about who to promote, working moms can be at a pretty significant disadvantage. There’s this subliminal case against hiring new mothers–but once you look under the surface, it’s easy to see just how much of that thinking is backward. Let’s take a look at some of the misconceptions that are driving that bias. Misconception: Mothers with young children are distracted. You know the adage, “If you want something to get done, ask a busy person”? There’s no one busier than a new parent who works. Yes, mothers of young children may have their in-office schedules constrained by the hours during which they have childcare coverage — but that’s a strength in disguise. It forces them to be extra efficient, and they wind up trimming from their days things that aren’t mission critical. You know the adage, “If you want something to get done, ask a busy person”? There’s no one busier than a new parent who works. They’re not frittering away time in the middle of the day, simply because they can’t afford to. That frugality with time is an invaluable mentality and skill set: the willingness and ability to prioritize and focus on what will deliver the biggest return on time invested. Misconception: Work isn’t the top priority for women with young children. This idea is one of the seeds that spawned the mommy wars, in which stay-at-home moms and working moms are pitted against each other as adversaries. It’s only true if you believe someone can only have one top priority–rather than believing that someone can care deeply and passionately about two different things. Someone can care deeply and passionately about two different things. For many new moms, their work is what tethers them back to themselves–the person that they were before having a baby. They become even more appreciative of the fulfillment they derive from work, because the mundane details of their evening job (being a parent) aren’t always rewarding–and are often the opposite. Misconception: Mothers are out of touch because they spend all their free time with a baby or kid. I’ll spare you all the stats about how companies with women on their leadership teams outperform the S&P 500; you can learn all about it in articles like this one. And if you want women on your leadership team, you need to groom them for those roles: Hire promising candidates and then empower them to succeed in your company. But there’s another element that’s rarely talked about, and that’s the buying power of women consumers. If you have a consumer facing company–or a company that engages with consumers in some way–it is crucial that you’re able to understand the mindset of mothers. In the U.S. alone, mothers spend $2 trillion each year, controlling 80% of household spending. They’re researching cars, steering the grocery cart, managing their family finances, and buying nearly everything else that comes through the door of their home. And the vast majority of women report that they feel like advertisers don’t understand them. So mothers are actually exponentially more in touch–and their perspective is crucially important to capturing some of the $2 trillion in spending that they control. Empowering a mother on your team doesn’t just mean that you’re getting someone who is a more effective communicator or more risk-conscious (though both of those things are true): You’re also getting someone with invaluable insight into an enormous market. Misconception: Women with young children are less ambitious. Amidst all the bias-laden clipart, there’s one image from the bunch that I liked, and that’s the one of a cartoon superhero. That’s the reality: the individual who has uncovered superpowers and tremendous advantages as a result of this new identity she’s taken on. And it’s why hiring managers should be looking at new moms as prospective MVPs, and why companies should be working harder to retain them. Allyson Downey is the founder of weeSpring and the author of Here’s the Plan: Your Practical, Tactical Guide to Advancing Your Career During Pregnancy and Parenthood. Connect with her at or allysondowney.com.